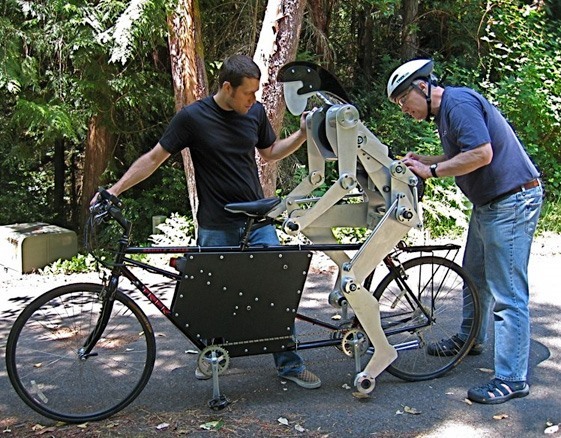 Robots have a long-standing obsession with tandem bikes. The first song ever sung by a computer? "Daisy Bell." If you don't recognize the title, you might nevertheless recognize the song's famous refrain: "But you'd look sweet/Upon the seat/Of a bicyle built for two." That was 1961. Joules exists because designing and making things is fun. Joules came from a challenge to build an electric tandem bicycle powered by actually pushing the pedals like a person. Fun kinetic design was part of the intent, practicality was not. Riding with Joules is a reminder that engineering and craftsmanship can be joyful pursuits. Engineering and art need not be separate. Previously, Legs o' LEGO: Pinocchio, the Amazing Bipedal Android. The song daisy creeps me out.